operate and offers a clear display. mere 3.5 cm it can easily be integrated into the fairing. and oil, so you will be well equipped for the road. won't be in the dark about all the vital information. 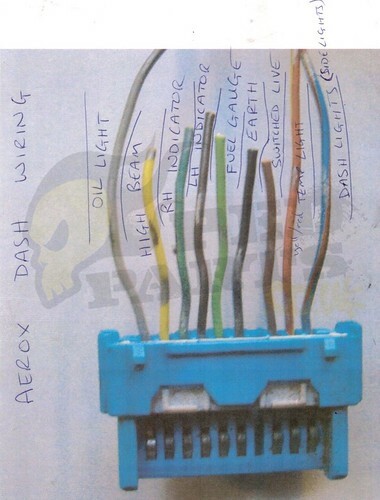 This shows the connector snipped off from the old speedo clocks, you can obviously connect your shiny new KOSO clocks or stage6 digital clocks directly to this or however you prefer. Quick note on the most common problems people have when fitting the magnets - if you drill a hole into the brake disc or disc bolts to house the magnet(s) the magnet(s) *must* stick out *at least* 1mm proud of the hole they're recessed into. If they're flush they won't work correctly. The airgap between the magnets and the pickup should be 0.8-1.0mm. The more magnets you use the smoother and more accurately the reading will update when your moped is speeding up or braking. Multiple magnets *must* be spread out evenly, so for example if you have a Gilera Runner with a 5-hole brake disc you can't fit 2 or 3 magnets if you're using the disc bolts to mount them because they wouldn't be spread evenly.